In almost a ‘Groundhog Day’ repeat of the previous VLN race at the Nurburgring two weeks earlier, FUGEL SPORT overcame atrocious and changing weather conditions to take the SP3 Class win last weekend. Again the event was stopped prematurely, although this time only 20 minutes short of the originally-scheduled 4 hour distance, due to a heavy crash by a Porsche in the rain. Typical of the 14-mile long Nordschleife mountain circuit, the track varied from sunny and dry at one end to streams of running water at the other, making the job of drivers Markus Fugel and Uwe Wächtler very demanding and proving the effectiveness of their KUMHO tyres. 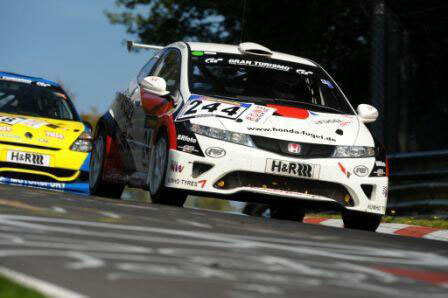 Nonetheless, they and the team performed faultlessly to make it 10 class wins in a row for the Chemnitz-Mittelbach team in their JAS-designed HONDA Civic powered by MUGEN’s NR specification development of the famous K20 4-cylinder engine. To add to FUGEL SPORT’s great satisfaction, their HONDA S2000 driven by Heiko Eichenberg and Friedhelm Mihm also finished on the podium, despite being challenged hard by the Renault Clio of Mathol Racing. Such consistent high-level performance is a great credit to this small but dedicated outfit and provides even further motivation for everyone involved, not least for MUGEN EURO.